Kenney Mencher: Why is Robert Rauschenberg’s art important? 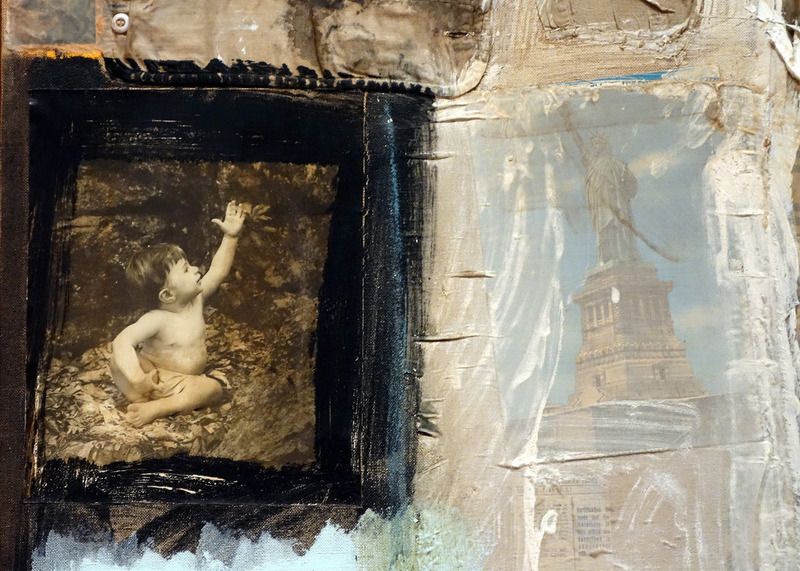 Context is probably more important than the actual work in terms of Robert Rauschenberg’s art. Like many artists who became famous in the mid-20th century, De Kooning, Pollock, Warhol, there are scores of them, all began their careers living, working, and most importantly socializing in New York City which was the center of the “Art World” in the 20th Century. When you dig deeper into many of the biographies of artists who “made it” in the 1930’s to 1980’s, perhaps even earlier going back to the first decade of the 20th century with the Ashcan School and the Armory show, you should notice that after the Paris, New York becomes the city in which artists moved to to establish their careers. 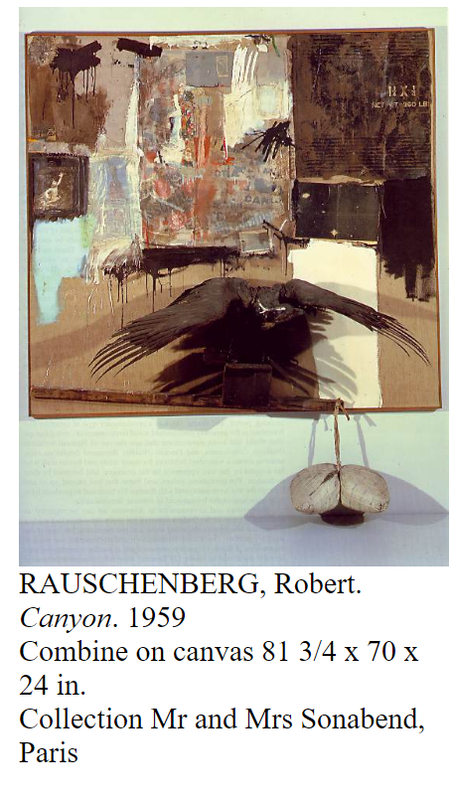 Rauschenberg ran in many of the same circles as some of the abstract expressionists. He knew and worked with a famous choreographer, Merce Cunningham, and there is enough compelling evidence to make it reasonable to believe that his downstairs neighbor and artistic partner Jasper Johns was also his lover. The two worked together as window decorators and it’s clear that Rauschenberg introduced Johns to his gallery. 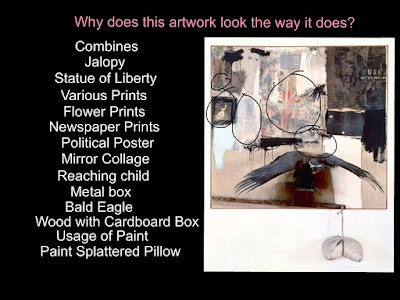 The physical or formal properties and working method that Rauschenberg, and Johns incorporated owes quite a bit to the earlier Dada movement and more importantly the reuse of found objects, often found by dumpster diving and collecting trash. Duchamp called this the “ready-made.” Picasso and other artists also used this technique quite a bit, especially in his synthetic cubist art and this validated the practice. Using repurposed junk and found objects became so much of a staple in terms of artists’ practices that it hard to visit any college artists’ studio without noticing something the artist has found in the street, dragged back to their studio and somehow repurposed and redecorating it to call it art. Rauschenberg used this technique extensively in the majority of his work from the 1950’s but instead of using Duchamp’s term “ready-made,” Rauschenberg named his technique the “combine.” Yeah, he combined stuff he found to make art. Rauschenberg’s “Canyon,” from 1959 Combine on canvas 81 3/4 x 70 x 24 inches uses layers of newspaper that have been painted over along with other found printed stuff. He combines these things with a stuffed bird, a pillow and other found things. 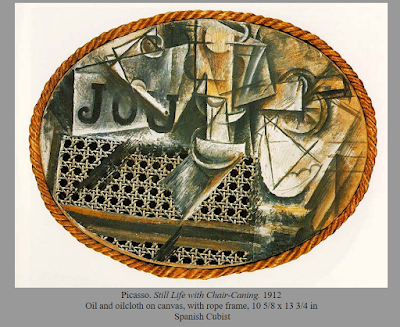 The work is not really a collage as is this case with Picasso’s synthetic cubist works or the earlier Dada artists’ collages such as those by Hannah Hoch. His work is not as organized as Picasso and Hoch, in fact it’s not really organized at all but rather has the appearance of being assembled in an unplanned way. When one looks at Picasso’s “Still Life with Chair Caning,” or other works, they are clearly organized in some way to represent something. To portray or make a facsimile of something that Picasso is rerepresenting. In Hoch’s work the work appears randomly organized because it doesn’t give the illusion of space but it does represent for Hoch the fragmentation of the world. Rauschenberg’s “Canyon” is harder to figure out. It’s almost like a kind of Rorschach or thematic Apperception test. Each person who looks at it and tries to figure it out will focus on different things and even the title doesn’t give us much of a clue as to how we are supposed to interpret it. We don’t know what it’s really about. I think that maybe the point. Rauschenberg's Canyon (1959), at the Metropolitan Museum of Art. They’re more than meets the eye. My first impression of the show—before looking at the imagery—was one of a controlled, formal richness. An artist in love with the hot and messy splash of inspiration, of course, but also one who’s knotty, thoughtful, and considered. Rauschenberg mostly worked with what Rosenthal calls a “syncopated grid,” a formal structure within which he weighted and composed lights, colors, and shapes. In an image like Canyon, for example, he calculated how the weight of the hanging bag sets off the strength of the eagle’s wings as it pulls upward into the image-laden sky. 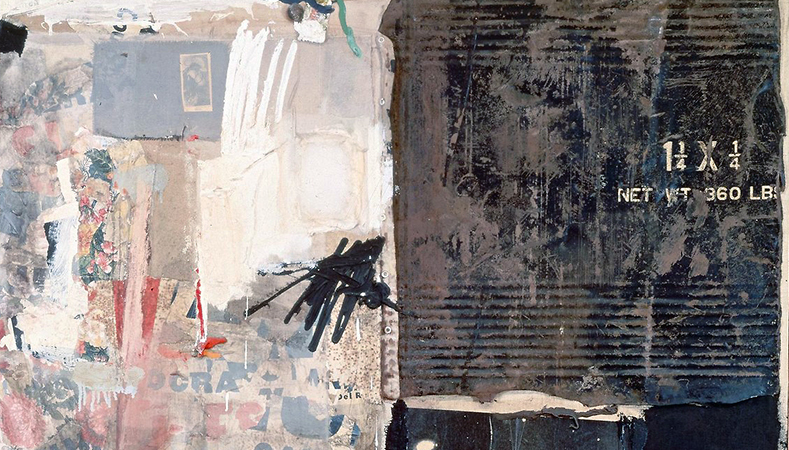 Reproductions don’t convey the tactile feeling of Rauschenberg’s color. His surfaces are rich, steeped, time-marinated. As you draw closer to a Combine, its imagery begins to come into focus, and everything starts to connect and connect and connect. You find that not only do the blacks in Canyon rhyme with the bird’s wings; so does that ribbing in the upper right, which mirrors the tips of the outstretched feathers. (And there’s wt., the abbreviation for “weight,” within the same ribbed black.) Canyon takes its inspiration in part from a Rembrandt Ganymede that depicts an eagle pulling a heavy, bawling boy into the air, one who looks rather like the child in the snapshot in the Combine; the hanging bag evokes the boy’s buttocks. Connections zigzag across mental boundaries. Weight, for example, can be literal or illusory, a matter of words, images, colors, and shapes. There’s an argument that art should probe deeply, that it should rigorously edit experience in order to reach some bedrock essence. Nothing wrong with that. 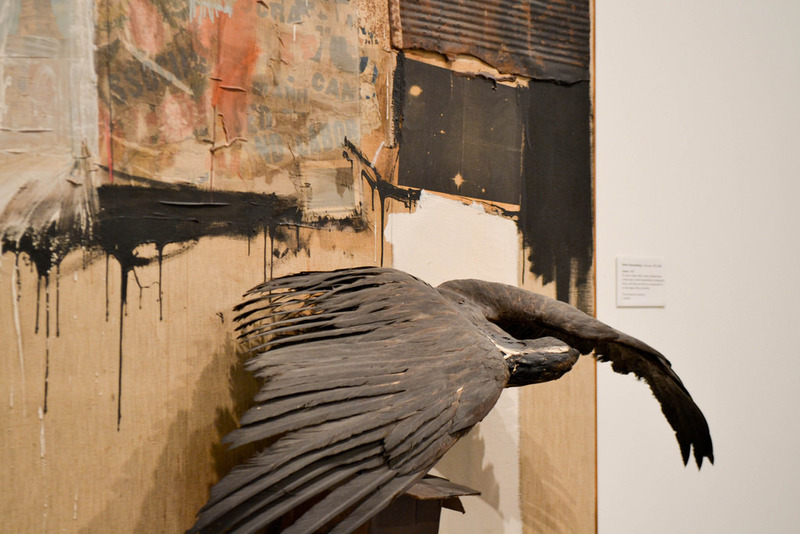 Rauschenberg’s endless connections, some lighthearted and some not, do something else. He celebrates the floating textures of consciousness—the way the mind moves, wanders, and joins together. One of my favorite Combines, Hymnal, contains (among much else) a book, a piece of paisley that looks the way hymns sound, and some ill-tempered graffiti. It can be good to concentrate on the hymn alone. It can also be good, as you pick up the hymnal, to acknowledge the message scratched on the pew. December 20 through april 2. Okay, had enough? Here’s what I think it really probably means. Johns and Rauschenberg, like Warhol, were part of a movement more popularly known as “Pop Art.” In art school students are often taught that the movement of Pop Art was in some ways a criticism of consumer culture of the last couple of decades. By making discarded junk that was mass produced into one of a kind works of “fine art” artists were pointing out the flaws in how we perceive things as valuable. 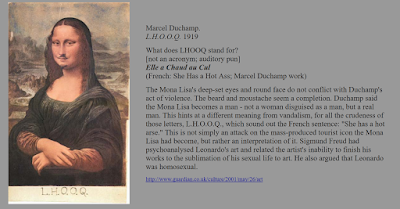 If this sounds familiar, it because Duchamp and the Dada movement had already done something like this decades earlier, but more interestingly and possibly with a bit more humor and fun thrown in. I think that Rauschenberg was sincere and was serious when he made the same kinds of artistic statements in the 1950s. I think Rauschenberg wasn’t really making an image but rather making an object that was designed to change how art viewers thought about art. Even though earlier artists like Duchamp, Max Ernst, Picasso and others were making art that reacted against or rebelled against earlier art techniques and meanings. Rauschenberg is doing something very similar, however he has raised the stakes by making something(s) that are actually pretty ugly and therefore they are meant to challenge us and to make us think about our ideas about what art is. 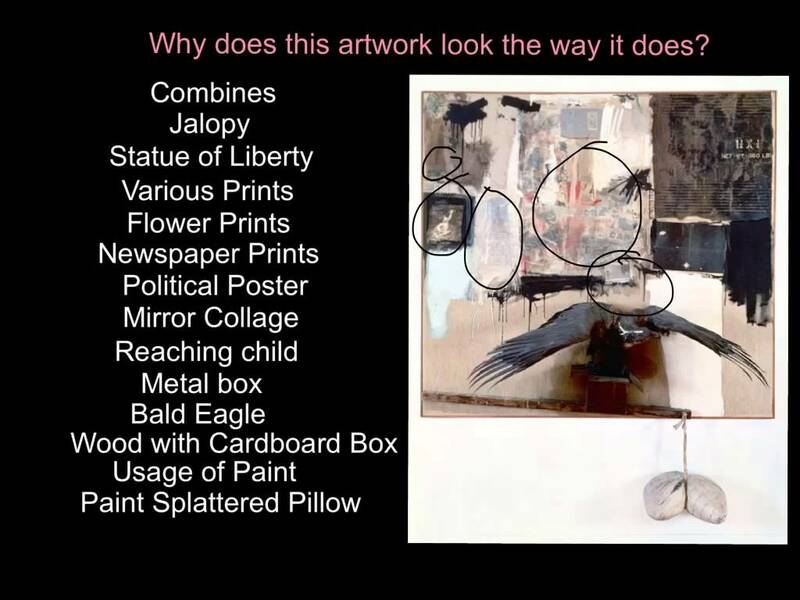 I think that the actual meaning or symbols in the piece might be irrelevant to the idea that his art is making us think about what art is, and what is precious about “art” even if made of junk hanging on our walls. What’s kind of funny about this is that by the time he did this, artists such as Duchamp, Hoch, Kirchner, Pollock, Franz Kline etc, had been doing this already for close to 50 years.